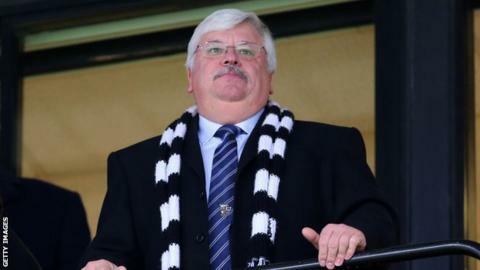 Owner Norman Smurthwaite says he will put Port Vale in administration if a buyer for the club is not found by 5 May. Smurthwaite told BBC Radio Stoke he will only fund Vale up to that point, as a result of supporter protests about his running of the League Two club. He claims that as much as £600,000 will be needed to keep the club going until the start of next season. "I wasn't the person or group of people who said 'you've got to go'," he said. "They didn't and don't understand the implications of what they've done, and they'll learn that as time goes by. "The football club has to trade through to 5 May and it will. I'll pay all of the bills up to that point. After 5 May, I will not put one cent more into the club." Carol and Kevin Shanahan, who own Stoke-on-Trent-based IT company Synectics Solutions, have made three attempts to buy the club and its Vale Park ground - which is owned by Smurthwaite in a separate company - since the start of February. The most recent of those is believed to be a bid worth in excess of £4m, and while Smurthwaite acknowledged those in a statement on the club's website on 1 March, he says no formal offer has been made for the football club. Smurthwaite added: "I've empowered (chief executive) Colin Garlick to deal with anybody who's in a position to buy the football club and be in situ by 5 May and pass all of the requirement tests. "If they meet that deadline, great. If they don't, the club will go into administration and it will get a 12-point deduction." Smurthwaite added that if a new buyer was found for the football club but they did not take ownership of the ground from him, he would be willing to negotiate a rental arrangement for Vale to continue playing at Vale Park. Smurthwaite spoke of "abuse" and "intimidation" he had received from some supporters and said he was "incensed" that a crowdfunding page had been set up by Vale fans to fund protests against him. However, Port Vale Supporters Club chairman Mark Porter stressed to BBC Radio Stoke that their protests had been peaceful and Vale's fans had been a "credit to the club". Smurthwaite said: "The 'peaceful' demonstrations that have been going on - sadly from where I've been sitting with the abuse I've been getting and the intimidation at my house and so on - haven't been peaceful. "From the 2014-15 season, I've never touched the season ticket money in the close season. We are the only club outside the Premier League that does not touch the season ticket money until 1 August. What that means is I fund the club in May, June and July. "I was so incensed to see that the supporters were putting a crowdfunding page on to get rid of me. They've got rid of me - I'm now gone. "You're going to need a very big crowdfunding page to cover what's effectively going to be £600,000 for the close season. "Anybody who's paid (for season tickets) on a regular payment plan will be refunded. There will be no creditors for the football club and nobody owed any money on 5 May. I will pay them all, and that's it." Of the protests, Porter said: "They've attacked the point, not the person. It's been orchestrated, in my mind, very well. We've supported the team, we've had a red card protest, and everything's been done peacefully as much as possible and organised the best we can. "We've not done anything other than what the supporters have asked of us. "It's not my fault and I know some people have said it was my fault - I wasn't the person who brought the vote of no confidence at the first meeting or the protests. "There's a great staff here and we have to be mindful of those people's jobs, and that's why it doesn't make any sense at all to put a company like Port Vale Football Club into administration. If that happens, that is an absolute disgrace." Vale are 21st in League Two, seven points above the relegation zone with seven games left to play this season.